CoolPac1100 Pre Qualified Insulated Pallet Shipper. The largest palletised multi use shipper for bulk shipments over the longest transit times from 96 to 144 hours. 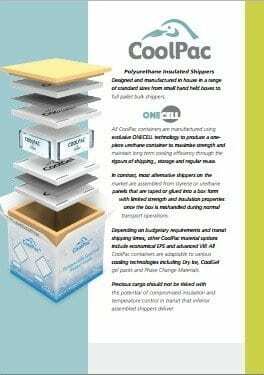 Highly efficient OneCell Urethane insulation. Pre qualified to ISTA 7D standards. 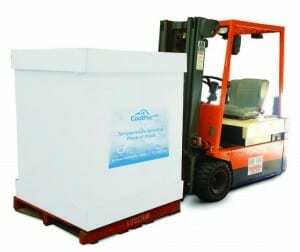 All Polyurethane Shippers stay within a temperature range of Frozen,+2 to 8 degrees °C, or +15 to 25°C. Use dry ice to ship frozen goods. Use a combination of chilled and frozen gel packs to ship chilled goods. Safely monitor product temperature and humidity during shipping. Recessed cavities allow for placement of temperature data loggers. Each box design has been through rigorous laboratory and real-life Cold Chain validation. Tested to ISTA and Australian Standards, and pre-qualified for summer and winter shipping conditions. Fully moulded One Cell design with excellent insulation properties and durability. CoolPac Polyurethane Shippers are twice as insulating as a Styrofoam Box. Kits include One Cell polyurethane container, CoolGel Gel Packs, product carton and Australian pallet. We supply replacement cartons so your Shipper can be re-used many times without compromising its appearance.